The clues are in the black squares making these puzzles quick and easy to solve. These crosswords are created in the popular clue-in-square style. The clues are in the black squares so these puzzles are perfect to take on a trip or carry in your bag for those spare moments in the day. 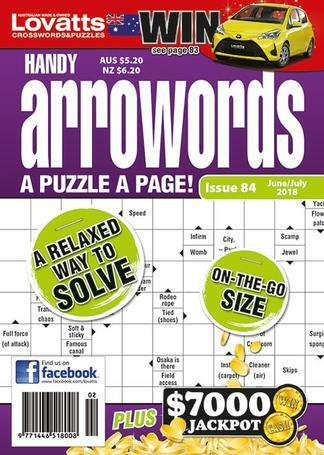 Each issue also includes arrowords themed around entertainment or general knowledge and every puzzle is doable and lots of fun. Subscribe today to enjoy FREE HOME DELIVERY and a chance to win cash in every issue! PLEASE NOTE: All cancelled or exchanged subscription orders for this title will incur a $10.00 Administration Fee for the processing of refunds. I always have great fun doing these puzzles, it keeps my brain active. For bi-monthly titles please allow up to 10-13 weeks for your first delivery. Your subscription will begin with the next available issue.